Very Good. The Lions of Lucerne by Thor, Brad. Mass market (rack) paperback. Glued binding. 512 p.
Very Good. In the tradition of bestselling authors such as Jack Higgins and Clive Cussler, a new voice in thriller writing has emerged to rival any of the masters. Mass market (rack) paperback. Glued binding. 512 p.
Good. In the tradition of bestselling authors such as Jack Higgins and Clive Cussler, a new voice in thriller writing has emerged to rival any of the masters. Mass market (rack) paperback. Glued binding. 512 p.
Very Good. The Lions of Lucerne (Scot Harvath) by Thor, Brad. Mass market (rack) paperback. Glued binding. 598 p. Scot Harvath, 1. Good. The Lions of Lucerne (Scot Harvath) by Thor, Brad. Mass market (rack) paperback. Glued binding. 598 p. Scot Harvath, 1. 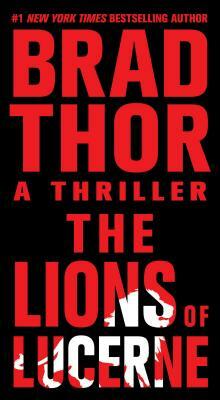 Brad Thor is one of the best around right now. I started reading his books a year ago and now buy them as soon as they come out. The Lions of Lucerne is is as entertaining a book of intrigue and excitement as any I have ever read. Once you read this book you'll be on the search for all of his other offerings.